VIEW LEAD LINED WINDOW FRAME SUBMITTALS & CAD DRAWINGS. NOTE: Don't cut frame opening until window frame is at job site! RadiationProtection Products' standard steel telescopic lead lined window frames match our hollow metal door frames. 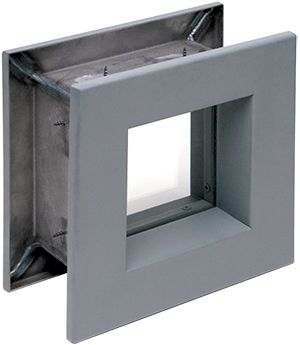 Made from 16-gauge steel, these lead lined window frames can be manufactured to accept any thickness of leaded x-ray glass or leaded acrylic. 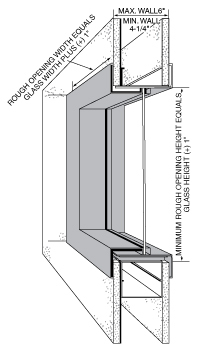 Lead lined steel telescopic frames can be built with steel bracing for maximum strength. The adjustable lead lined steel telescopic frames adjust to wall thicknesses of 4-1/4" to 6". Special construction of lead lined frames available to meet your specifications (i.e. special steel reinforcement, wider wall thickness, special sizing, etc.). This information is the same for all lead lined frames ordered. Request a quote on lead lined window frames. Contact Radiation Protection Products for all of your radiation protection needs.